Specimen from an unspecified location in Thailand. Two males showing head growths typical of mature specimens. Adult males possess thickened rays in the pectoral fins and some individuals develop what appears to be some form of nuchal hump, both characters clearly visible here. Some populations exhibit differences in colour pattern. Detail of head and anterior portion of body; adult male of the spotted form. Described from the Kapuas river basin, West Kalimantan (Kalimantan Barat) province, Indonesia (Borneo) and since recorded from the Batang Hari river system, Sumatra, Peninsular Malaysia, the Chao Phraya river in Thailand and Mekong in Thailand, Laos, Cambodia and Vietnam. This patchy distribution suggests additional populations are likely to exist although the species as currently-recognised appears to represent a complex of closely-related taxa (Kottelat and Lim,1993; Tan and Kottelat, 2009; Bohlen et al., 2011). Most commonly found in shallow, slow-moving sections of streams or calm habitats such as swamps, oxbows and backwaters. These are often heavily-vegetated or scattered with submerged roots, branches and leaf litter with substrates composed of soft mud, sand or silt within which the fish conceal themselves. In the highly diverse Danau Sentarum National Park and Kapuas Lakes area, Kalimantan Barat P. anguillaris occurs sympatrically with numerous other species including Cyclocheilichthys janthochir, ‘Puntius‘ anchisporus, ‘P.‘ kuchingensis, ‘P.‘ lineatus, ‘P.‘ rhomboocellatus, ‘P.‘ trifasciatus, Brevibora dorsiocellata, Rasbora cephalotaenia, R. sarawakensis, Trigonopoma gracile, T. pauciperforatum, Barbucca diabolica, Nemacheilus saravacensis, N. spiniferus, Kottelatlimia pristes, Pangio malayana, P. oblonga, P. semicincta, P. shelfordii, Chaca bankanensis, Hemirhamphodon pogonognathus, Betta dimidiata, B. pinguis, and Luciocephalus pulcher. Chiefly a micropredator sifting mouthfuls of substrate through the mouth and gills from which insect larvae, small crustaceans and suchlike are extracted with a proportion of the natural diet also likely to comprise organic detritus and plant material from the gut contents of prey. Diminutive, peaceful species from similar environments including genera such as Boraras, Sundadanio, smaller Rasbora, Trichopsis, Sphaerichthys, Kottelatlimia, etc. constitute the best tankmates. 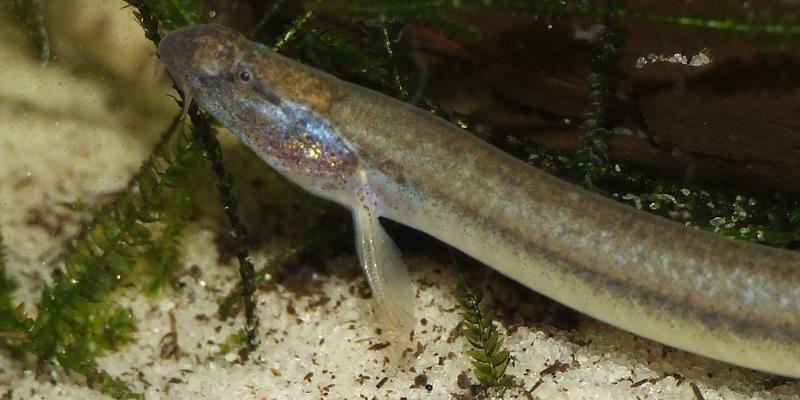 Some sand-dwelling loaches from the family Nemacheilidae are also suitable but proper research is essential as some can be excessively territorial, aggressive or otherwise competitive. Adult females are typically heavier-bodied and a little larger then males, while in adult males the first pectoral-fin ray is branched and thickened and the pectoral fins themselves are upturned and longer than those of females. Mature males of some populations develop what appears to be a nuchal hump on the head. Has not been bred in captivity as far as we know. According to Rainboth (1996) spawning occurs in shallow water with abundant vegetation. One of a handful of Pangio spp. traded under the generic name ‘eel loach’, though it’s most commonly available as bycatch among shipments of other fishes. Wild populations tend to differ in colour pattern to some extent, with some exhibiting a more intense lateral stripe while others display an irregular pattern of fine dark spots on the body, for example. It’s included in the P. anguillaris group of closely-related species within the genus and is most easily told apart from other members by its extremely elongated body with 69-71 vertebrae (vs. 54-56 in P. lumbriciformis), lack of nasal barbels (vs. present in P. bitaimac and P. lidi) and lack of cheek scales (vs. present in P. doriae). Kottelat and Lim (1993) suggested that the P. anguillaris group is one of four such assemblages within the genus alongside the P. kuhlii, P. oblonga and P. shelfordii groups, and this unofficial system was followed until Bohlen et al. (2011) published a molecular phylogenetic analysis including 18 recognised species plus a number of undescribed ones. The type locality of P. anguillaris is in central Borneo but the specimens used in the study were collected in Thailand and Laos and formed two distinct groups. It’s therefore likely that unidentified species exist in this species group, and possible that none of those analysed actually represented P. anguillaris. Other species in the P. anguillaris group include P. bitaimac, P. doriae, P. lidi, P. lumbriciformis and possibly P. signicauda. 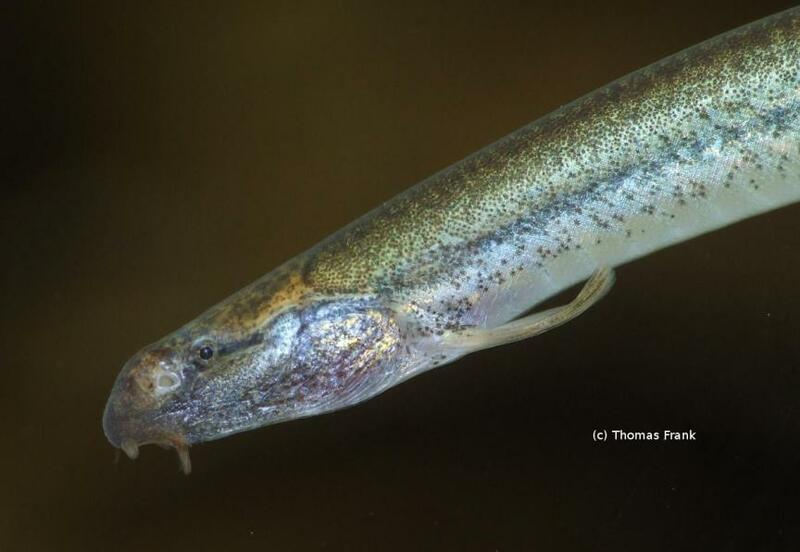 They’re most obviously separated from those of the P. shelfordii and P. kuhlii–oblonga groups by their high vertebral count and vermiform (worm-like), usually patternless, greyish-coloured bodies.